Hemel Hempstead Town FC have been crowned champions of Hertfordshire after beating Boreham Wood 1-0 in the final of the Herts Senior Cup at The County Ground in Letchworth. One magical swoosh of skipper Jordan Parkes’ wand of a right foot was enough for Hemel to earn the win as he delivered a trademark free-kick winner to send the Tudor faithful into raptures. 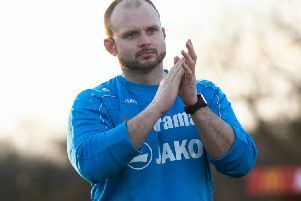 Three days are a long time in football, and that was clear tonight as the final whistle was met by a joyful embrace between Hemel manager Dean Brennan and chairman Dave Boggins following their spat after the game on Saturday. Fittingly, it was left to captain marvel Parkes to lift the trophy for the second time in three seasons as the Tudors got revenge on title-chasing Boreham Wood following two league defeats this season. In truth, the final was a game of few chances, but Hemel stuck to their tactics manfully and were good value for their narrow win. Neither side created much in a cagey but hard-fought first half, although the Tudors were indebted to goalkeeper Jamie Head –starting in place of regular number one Laurie Walker – as he produced a fine stop to deny Wood striker Charlie Walker as he raced through one-on-one. James Potton and James Simmonds were working hard in midfield for Hemel, and it was the latter who produced the first real moment of quality for the Tudors in the second period as he latched on to the ball after good hold-up play from Nicky Kabamba and fired in a shot which Wood keeper James Russell did well to turn away. The Tudor faithful waited expectantly as their skipper placed the ball and, sure enough, he curled a delightful effort over the Boreham Wood wall and into the net past Russell’s despairing dive. Borehan Wood looked for an equaliser as the clock ticked on, but Hemel – marshalled excellently by young centre-backs Dom Hyam and Jorrell Johnson – saw out the remaining minutes to secure their title as the Kings of Herts once again.